Market Magento Theme is one of the hottest magento in Envato with its nice design and mutilfunctions. Now, users will feel fantastic with 3 more best compatible modules from Aheadwork. Let's explore! A suitable appearance of a store is determined by included fonts, colors, page styles, icons, etc. Meanwhile, the business value mostly rises from the provided functionality and is much more complicated. The more functions you get with your theme the fewer troubles you have when you start selling products, and the more chances you have to meet your customers’ expectations. One more thing you need to consider is the readiness to customization and available default compatibility with third-party solutions and functionality extensions. Loyalty programs and retention mechanisms, etc. 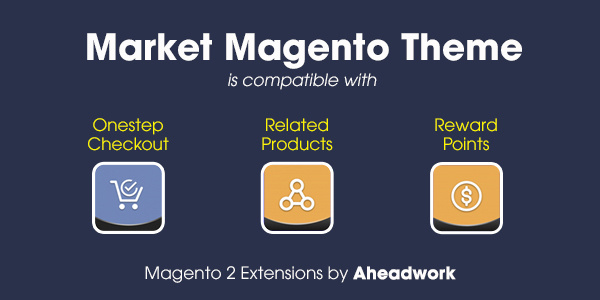 Market Magento Theme is a really powerful ecommerce and provides these functions out of the box, but you can significantly improve the mentioned areas with particular Magento extensions such as Aheadworks modules. Today, we are glad to announce that Magento 2.X stores is compatible with three functionality extensions by Aheadworks, including Smart One Step Checkout, Automatic Related Products, and Layered Navigation, out of the box. Moreover, if you purchase our Market theme together with the above Aheadworks extensions, you will get the 10% discount on the compatible modules. Please contact us in order to get the discount. Detailed use statistics and backend balance editing. Detailed functionality descriptions you can take advantage of are available on the extension product pages.